A sure sign of spring – rhubarb. What could be better than a piping hot bowl of rhubarb crumble? Or how about a delicious rhubarb pie, summery rhubarb fool or homemade rhubarb jam? 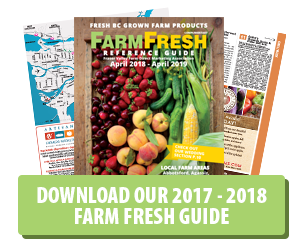 With so many classic rhubarb recipes to choose from you’ll have no problem in deciding how to use your BC Farm Fresh rhubarb! Some fun facts: as you enjoy your rhubarb. Botanists actually classify it as a vegetable. However, a New York court decided in 1947 that since it was used in the United States as a fruit, it counted as a fruit for regulatory purposes. In medieval Europe, rhubarb was highly valued and was several times the price of other valuable herbs and spices such as cinnamon, opium, and saffron. Rhubarb first came to North America in the 1820s, landing on the eastern seaboard and moving westwards with the early settlers. Don‘t be tempted to try the leaves! They contain poisonous substances, including oxalic acid, which is a nephrotoxic and corrosive. Move over kale; here comes another super “vegetable”. 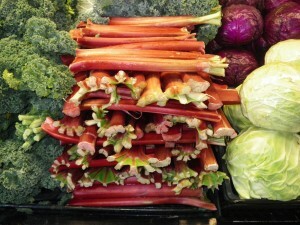 One hundred grams of fresh rhubarb only has 21 calories. It’s packed with vital phyto-nutrients such as dietary fiber, poly-phenolic anti-oxidants, minerals, and vitamins. It’s rich in several B-complex vitamins such as folates, riboflavin, niacin, vitamin B-6 (pyridoxine), thiamin, and pantothenic acid. Be sure to enjoy some fresh, local rhubarb this spring. No matter how you stack it; it’s fabulous! 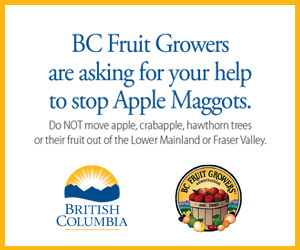 Thanks to Nature’s Pickin’s Market for the picture.